Do you have a tenant who does not always pay rent on time? 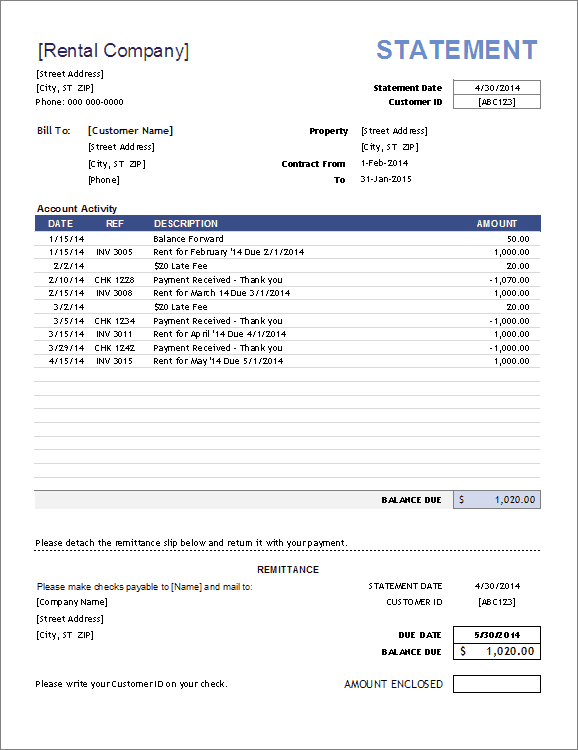 A professional way to send reminders is using a rental billing statement. With this template you can track all payments, invoices, and late fees charged to your tenants. Then, print a copy of the statement to give to your tenant if they miss or are late on a payment. This template has been customized from our original billing statement template specifically for landlords needing a simple way to bill their tenants. It provides a simple way to keep track of invoices, payments, and fees charged to your tenants. It includes a place in the header to list the property associated with each tenant's account. For multiple properties, you can either save a separate file or make a copy of the worksheet to keep everything within the same workbook. When sending the rental statement, you may not want to show a record of all prior payments and amounts due. For example, if you routinely sending a statement at the end of each month, you may just want to show the transactions for the current month (and enter a Balance Forward as the first line in the activity table). You could still save a copy of the worksheet to be used as your own record of all transactions. Remittance: The Remittance section at the bottom of the worksheet is not absolutely necessary, but it does help the tenant to see the Due Date and Balance Due and it gives them a way to help ensure that you process their payment accurately. If you insert rows more rows into the table, the remittance could end up overlapping two pages and that wouldn't work well. Instead of listing multiple months of transactions, consider using a Balance Forward and only listing the most recent transactions. Or, add enough rows so that the entire remittance section shows up on a separate page.